Phriendly Physics is a Next Generation Science Standards-infused physical science program including field trips to the Lederman Science Center for elementary students and a professional development program for teachers. Phriendly Physics is also part of Benedictine University's M.S. in Science Content and Process degree program. The workshop helps K5 teachers understand and feel comfortable with concepts of physical sciences through facilitated exploration of a series of simple, open-ended experiments, and through discussion and reflection with a master elementary school teacher and Fermilab scientists. Through this process participants gain a deeper understanding both of the physics concepts and of new approaches in teaching and learning using the scientific method and scientific journaling. 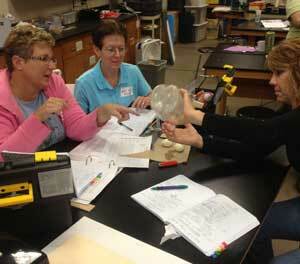 Participants also receive equipment and supplies so they can continue to explore these concepts with their students. "The instructor modeled ways to encourage flexible thinking among students and ways to deepen and enrich the way I teach science." "I really enjoyed the discussion on the Next Generation Science Standards and the instructor's focus on implementing them." Phriendly Physics focuses on the classroom. Participants not only learn concepts, but also start to think like scientists. All of the activities from the workshop can be done in the classroom, many with inexpensive and/or household materials. The most important thing participants will do is learn how to help students frame and explore their own questions, just like real scientists. Teachers may schedule one or more of the four available Phriendly Physics field trips at Fermilab. Each of the field trips features special activities at the Lederman Science Center. The field trips are designed to wrap up a unit of study with exciting activities serving as focal points for the exploration of a topic. Use the Field Trip Request Form. Electricity & Magnetism: Explore the properties of magnets and electrical circuits to discover how they are part of the same force! Students will design and construct a unique magnet, investigate different types of circuits, and discover what creates natural batteries. Data is recorded throughout each of the explorations. Forces & Motion: Investigate Newton's 1st (Inertia) and 2nd Laws (acceleration) through a series of explorations while comparing and contrasting data. Students discover the physics of energy and work through simple machines by investigating force, stored energy, lift and consider the applications to their world. Heat: Explore heat energy! Students explore and analyze the concepts of conduction, convection, heat transfer and the different ways heat can be produced. Light & Color: Discover the fascinating properties of light and make connections to the world around them. Students use everyday tools to explore and observe the properties white light, colored light, shadows, refraction and reflection. Graduate Credit: K-2: 1 semester hour. Click here to register for graduate credit only. 3-5: 2 semester hours. Click here to register for graduate credit only. Graduate credit is available through the University of St. Francis. Click here for more information.